Slow Cooker Sesame Chicken in an easy crock pot chicken dinner. The sesame chicken cooks in a sweet and savory sauce that’s perfect with rice and veggies. As one of my kids moves out of the picky eating phase, it seems like the next one moves into that phase. We don’t have the normal dinner battles, though. My kids are actually pretty good eaters when it comes to fruits and vegetables, and they are pretty willing to try new foods. The biggest dinner battle that we have is about meat. It seems like if one kiddo likes beef, the other one wants nothing to do with it. Thankfully, my two year-old hasn’t gotten in on the pickiness yet. 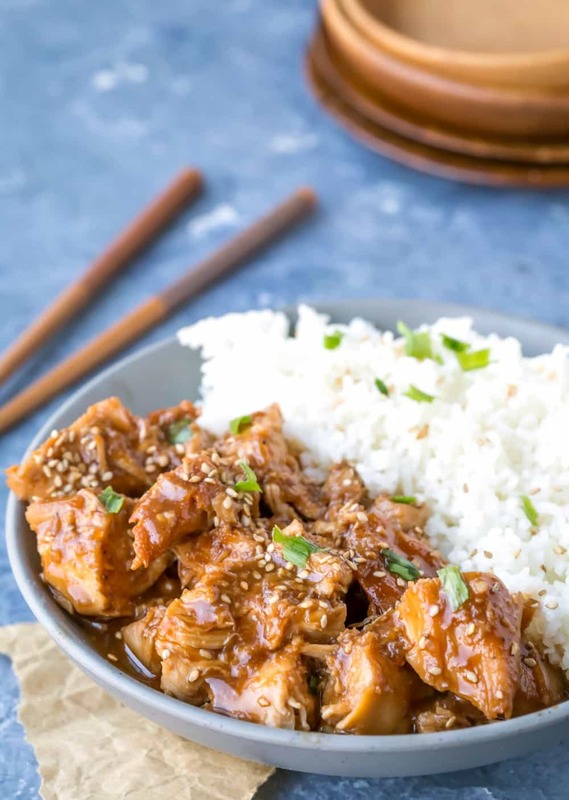 Chicken is one of the meats that everyone will always eat, so I love easy chicken dinners like this Slow Cooker Sesame Chicken. The chicken cooks in an easy sweet and savory sauce, and it’s delicious served with rice and veggies. 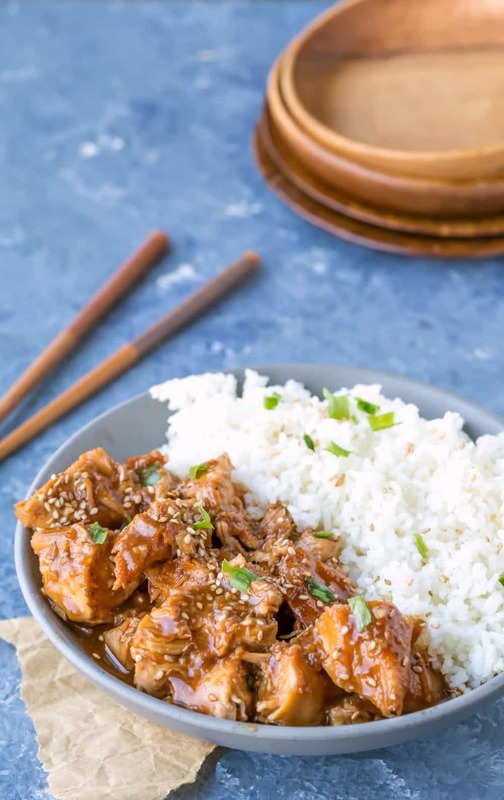 This slow cooker sesame chicken has a shorter cooking time than a lot of slow cooker recipes. It’s great for those times when you need to make dinner and walk away for a few hours. I love these shorter recipes for times when I need to run errands. This is a recipe that I can start in the afternoon and then leave to go pickup/drop off kiddos from school and activities, and by the time we get home, dinner is ready, which is pretty fantastic. I serve this chicken over rice, and I serve it with either sautéed broccoli or green beans. More easy chicken dinner recipes! More crock pot chicken recipes! 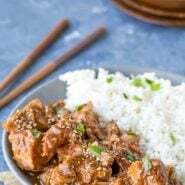 If you’ve tried this slow cooker sesame chicken recipe, don’t forget to rate the recipe and leave me a comment below. I love to hear from people who’ve made my recipes! You can SUBSCRIBE to receive my latest recipe newsletters or FOLLOW ME on FACEBOOK, INSTAGRAM and PINTEREST for even more delicious food. 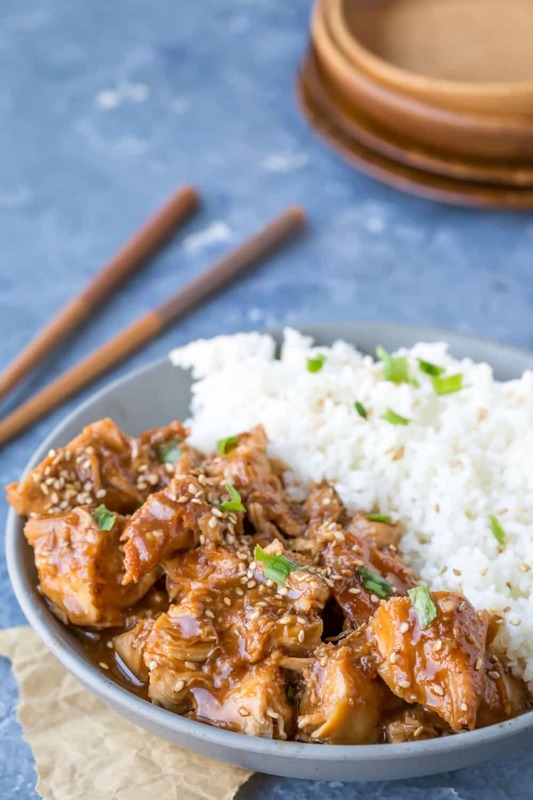 Slow Cooker Sesame Chicken in an easy crock pot chicken dinner. The chicken cooks in a sweet and savory sauce that's perfect with rice and veggies. Sprinkle with salt and pepper and cornstarch. Stir honey, soy sauce, ketchup, sesame oil, Sriracha, onion, garlic, and ginger together in a bowl. Taste, and add additional honey as needed. Cook on LOW until the chicken is tender about, 3-4 hours. Remove chicken from the sauce in the slow cooker to a cutting board. Cut chicken into small pieces, and stir back into the sauce. Serve sprinkled with sesame seeds and sliced green onion. Love this easy sesame chicken recipe. It was just like going out for Chinese without leaving home. The sauce was delicious! I am still unsure of the fact that recipes call for pounds, instead of 4 chicken breasts (just an example) What’s up with that? Chicken breasts can vary in weight – anywhere from about 4-12 ounces per breast. So, 4-4 ounce breasts would have a different cooking time than, say, 4-12 ounce chicken breasts. Hope that helps! Yum! And it’s a recipe that works on a budget, too! I don’t know what my mom did with me, but I have always loved all sorts of food and don’t think I ever really had a picky period. I think the only thing I really grew into was onions… and the only thing I will never grow into is liver anything. This sesame chicken looks SPECTACULAR! I’ve wondered whether it’s a generational issue because I don’t remember many picky eaters from when I was a kid. I’m right there with you on the liver though! That is one food that I’ve never been able to get a taste for. Thank you! !